Dr. P. Chinnaswamy did his Master Degree in Biochemistry in Madras University, Chennai in the year 1981. He has been awarded with membership Degree in American Association for Clinical Chemistry in USA in the year 1981 for his research work on multiple myeloma. He has been awarded with Ph.D in Biochemistry by Bharathiar University in the year 1990 for his work on Urinary Bladder Cancer.He has been awarded with fellowship of Indian Chemical Society and fellowship of International Federation of Clinical Chemistry. He has been awarded with Fellowship degree by the American Academy of Clinical Biochemistry in USA in the year 2002. He worked in Tamilnadu Medical Educational Service for 30 years as Assistant Professor of Biochemistry. 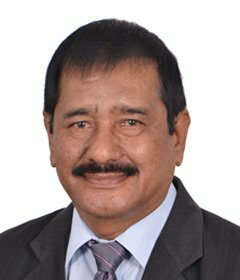 He was a consultant in Clinical Chemistry and Chief of Laboratory Medicine and Blood Bank, Kovai Medical Center and Hospital Limited, Coimbatore, Tamilnadu, India for of the past 26 years. He was a Guide/Supervisor for Research work leading to award of Ph.D in the Tamilnadu Dr. M.G.R Medical University, Chennai, Bharathiar University and Karpagam University, Coimbatore , India. He worked in Kerala University of Health Sciences for 12 years as Professor of Biochemistry. Presently he is a Consultant in Clinical Chemistry and Chief of Laboratory Medicine and Blood Bank in Royal Care Super Speciality Hospital Limited, Coimbatore, Tamilnadu, India. He is specializing in Identification of the oncogens GUSB in Urinary Bladder Cancer by DNA Microarray for the research leading to the award of D.Sc degree in Tamilnadu Dr. M.G.R. Medical University, Chennai. Best Educationalist (Best Principal) award by the International Institute of Education Management (IIEM) in the year 2007. Best Educationalist award by International Compendium in the year 2008. Best Research paper award 2008 by International Journal of Cell and Tissue Research published in Vol.8(2) 1437-1442(2008). Member Editorial Board of International Journal of cell and tissue Research. Research Article evaluator for publication in International Journal of evidence based Medicine and Healthcare. 20 of his Research Scholars have been awarded with Ph.D. Degree in Tamilnadu Dr. M.G.R Medical University. Chennai and Bharathiar University, Coimbatore and 10 of his Research Scholars have been awarded with M.Phil degree in Bharathiar University, Coimbatore. Presently one Research Scholar is doing Ph.D under him in Karpagam University, Coimbatore. He has published 75 Research Articles in National Journals and 50 Research Articles in International Journals on Medicinal Chemistry. He has participated in more than 25 International Conferences in more than 20 Foreign Counteries.